Early last year we reviewed one of our first projectors at XSReviews, the BenQ W1060. We awarded that projector 9/10 stars, lauding its picture quality, connectivity options, accessible OSD and good value. One year and a few months later, we’re back with its successor: the BenQ W1080ST. The new model comes with a way shorter throw ratio, 3D capabilities and a lighter build – but does it maintain the same thoughtful design as its predecessor? Let’s take a look. The W1080ST follows the standard layout that we’ve seen on all BenQ projectors so far: a large exhaust on the left, a BenQ logo in the centre and the lens in the right (with lens cap attached via a short rubbery cable). The controls sit on the top, while the device’s connectors are all at the back. The left and right sides are all grilles, while the bottom has the usual manufacturing information which makes for brilliant bedtime reading. Finally, there’s an extending leg near the front of the projector which allows you to angle the beast to more accurately hit the wall you’re aiming it at, and a pair of smaller screwable feet that can help you finetune your projection position. The controls are the same layout as we’ve seen previously, with a 9 button grid and a tenth power button off to the left. In the 3×3 grid, we have four directional keys (which pull double duty as volume and keystone adjustments), plus buttons marked ‘menu/exit’, ‘auto’, ‘mode/enter’, ‘eco blank’ and ‘source’. It’s a sensible arrangement, and makes navigating the on-screen controls quite easy. The top also holds the zoom and focus dials. The zoom dial is thinner and has a handle to hold onto, while the focus dial is wider and bereft of a handle. Both are easy to use. The back of projector is the interesting bit, as it has a nice assortment of ports. We have the same inputs and outputs as on the W1060: two HDMI ports, component, VGA, S-Video, composite and 3.5mm audio in and out. There’s also a new port labelled ’12V trigger’, which is used to trigger other devices when the projector is turned on and off (for example, you could turn on a fan or deploy a projector screen). The left and ride sides are just grilles. Don’t believe me? Take a look! The remote is again similar to what we’ve seen before. It’s small and packed with quite a few small buttons, so you may end up squinting to find the one you want in poor light. Still, it’s perfectly usable. And that’s the physical features all accounted for. Overall, this is a compact and sensibly arranged package that’ll be familiar to anyone that’s used a recent BenQ projector. Compared to the W1060 that we looked at last year, it’s considerably lighter and smaller, making it easier to set up and more convenient to transport. We’ll test this projector the only way we know how – by watching lots of stuff on it, and reporting on the results. Setup was a little trickier in the new XSR offices, thanks to a notable lack of vertical walls (ah, the perils of working on the top floor). We improvised by angling the projector to throw onto the angled ceiling instead, which provided a much larger area. The short throw capabilities of the projector impressed us – indeed, at around 12 feet from the wall, we needed to dial back the projection to its smallest setting and still ended up with a ten foot (120″) diagonal screen (roughly nine feet across, five feet deep). The setup; click picture to see full image. We used the projector to watch K-Pop music videos, take in a few films and of course to play some games. We played Grid Autosport on PC, Forza 5 on Xbox One and Need for Speed Rivals on PlayStation 4 – I guess we’ve been on a racing game kick recently! We didn’t test the 3D capabilities of the projector, as glasses aren’t included in the retail package. 3D glasses from BenQ cost around £80. Sitting down in front of the projector was quite an experience, with sufficient width to fill our vision completely at such a short range. The visuals were quite overwhelming, with the 1080p gameplay looking suitably realistic whether driven from the Xbox One, PlayStation 4 or PC. There is some graininess from the relatively low pixels-per-inch measure, but that’s to be expected. A higher resolution will be a nice bonus in the future (bring on 4K!) but for this generation 1080p is a good choice. The projector’s brightness was impressive, with the projection remaining visible even with plenty of other lightning in the room at night, or during the day with the curtains only half-drawn. The colours on-screen seemed accurate, and similar to the 1440p calibrated display we typically use for gaming. Black levels, normally a problem for projectors (and specifically the W1060 we looked at last time), were very good – not quite on par with an HDTV, but solid nonetheless; you could easily see what was going on even during the dark nighttime portions of endurance races. Darker film scenes were a little bit harder to make out, but remained comprehensible even if some detail was lost. The only real downsides to the display were those of sound. Firstly, the 10W speakers were a bit weedy, and couldn’t match the fidelity of the display provided. As usual, a separate sound system is recommended if you’re really looking for that home cinema experience. Secondly, the projector’s fans do produce a decent amount of noise and a small amount of heat after an extended period. If you’re sitting quite close to the projector (and you may well be, given its short throw ratio), then you’ll need to keep the volume high and the room cool while using the projector. I expected a lot from the W1080ST, and the projector delivered in spades. The new short throw ratio makes the projector usable in much tighter spaces than before, and the image quality remains high. In fact, the tricky part for any projector – black levels – seem better here than on other projectors that I’ve tried. The only real negative I can find is the lack of included 3D glasses, but even that is understandable given the rather low price of the projector. 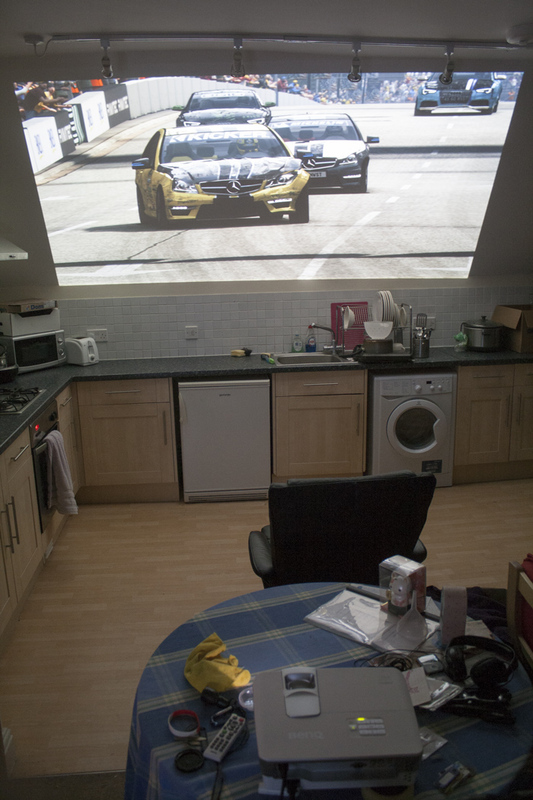 As 3D is not commonly used in home projection, it’s quite acceptable to leave them out and keep the retail price low. With the new generation of consoles (mostly) running at 1080p, picking up a 1080 projector is a sensible alternative to a large HDTV. At £800, this projector produces an image that rivals HDTVs of equal prices… and this projector can make a much larger screen for the money. Whether you’re gaming or watching films, the W1080ST is definitely worth a look.